Graphene is the world's most impermeable material, and as the material is also transparent, flexible and ultra-thin it makes sense to adopt graphene as an encapsulation layer for next-gen OLED displays. A UK project led by Cambridge University researchers have set out in 2015 to develop such a solution, and the researchers now report that they have demonstrated a viable graphene solution comparable to existing commercial OLED encapsulation technologies. In its pure form, graphene is permeable to all gases, but real life materials are never entirely pure and defects and holes harm the material's permeability. The new research used ALD and CVD to create large-area high-quality single-layer graphene sheets which were stacked to create a multi-layer coating. 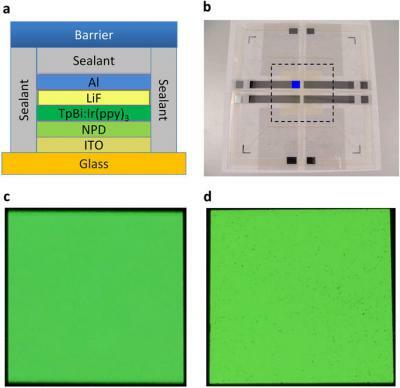 The researchers say that a ~10 nm barrier layer that includes 3-4 layers of graphene (with AlOx in between) is an effective solution for OLED displays. The 10 nm layer maintains a high optical transparency (>90 %) and high flexibility. UBI Research says that as OLED makers are diverting all efforts into flexible OLED production, thin film encapsulation (TFE) is gaining in popularity. Between 2017 and 2021, TFE will be applied to about 70% of all OLED panels in production. The OLED encapsulation equipment market will generate $11 billion in sales. TFE encapsulation started out as a complex technology that required 11 layers and was slow and expensive. Recent advances allowed OLED makers to reduce the number of layers to just 3 and increase productivity and yields and so lower the production costs. Some film OLED makers opted for hybrid encapsulation (which uses a barrier film) but TFE seems to have become the technology of choice. Researchers from the Holst Centre developed a new process to deposit semiconductor layers with better performance and high throughput than PVD-based process. the new process is based on scalable, atmospheric-pressure process spatial-ALD. The Holst Centre used sALD to deposit IGZO backplanes that achieved charge carrier mobilities of 30 to 45 cm2/Vs. The researchers say that similar backplanes deposited with PVD (supttering) achieve about 10 cm2/Vs. The sALD layers also exhibited low off current, switch-on voltages around 0 V and excellent bias stress stability. In September 2013, Veeco acquired Synos Technology for $185 million for the company's FAST-ALD flexible OLED encapsulation technology. Veeco did received a purchase order from SDC for a first-generation FAST-ALD prototype system, but the significant orders Veeco hopes to achieve never materialized. In early 2015 Veeco announced that they do not see near-term revenue coming from this sector. Yesterday Veeco decided to significantly reduce future investments in its ALD technology development. Veeco says that some "competitive technologies" solved the display makers problems and it now sees ALD business pushed back two or three years. A few days ago we reported that Kateeva says it has taken a "commanding lead" in the OLED thin film encapsulation (TFE) market with its ink-jet based systems. Kateeva's ink-jet printers are used to deposit organic materials, but the full TFE stack also contains in-organic materials. Currently both LG and Samsung producers are using PECVD to deposit the in-organic materials, but according to a report from ETNEws, both Korean display makers are thinking about switching to ALD. Several companies, including Jusung Engineering, WONIK IPS, AP Systems and TES has ALD-based encapsulation deposition systems ready to be used in display production. Both LG and Samsung have finished with R&D work on ALD technology and are ready to introduce commercial systems into their production lines.